Waterproof briefs for incontinence protection. 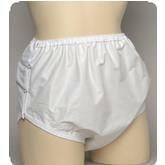 Made of soft, white, plastic-coated nylon, making them the perfect cover-up for pads and diapers. Accommodate disposable or reusable pads and liners. Machine washable.